Stainless steel case with a stainless steel oyster bracelet. Uni-directional rotating stainless steel bezel with black top ring. Deep blue dial with luminous hands and dot hour markers. Minute markers around the outer rim. Dial Type: Analog. Luminescent hands and markers. Date display at the 3 o'clock position. Automatic movement. Scratch resistant sapphire crystal. Screw down crown. Solid case back. Case diameter: 44 mm. Round case shape. Oysterlock clasp. Water resistant at 3900 meters / 12800 feet. Functions: date, hour, minute, second. 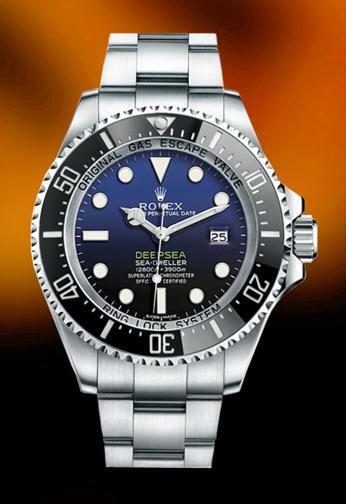 As a tribute to the partnership between Rolex and filmmaker-explorer James Cameron, the "DEEPSEA" marking on the D-blue dial is the same green colour as Cameron's submersible as perceived underwater. The markers and hands are treated with Chromalight luminescence with a distinctive blue glow that lasts up to eight hours with a uniform luminosity.